pikeonaplate | An online food diary, by Pike. An online food diary, by Pike. About me. Why a blog? “Congratulations, You’re in the Top 50…” Wait, what? Well there’s the six words I’d never thought I’d hear. It gave me the opportunity that thousands have tried to get, and I turned it down. To give this story context, one of which that I have been asked countless times, I’ll have to go back 24 hours prior to that dialogue from George Calombaris, and why I thought I’d give auditioning for Master Chef Australia a go. As you would have guessed by now, I love cooking. Massive understatement I know, well done Captain Obvious. However with the national phenomenon that was, well is, the juggernaut Master Chef, friends and family started suggesting that I give it a go & see what happens. I never in a million years thought that I could see myself succeed in that platform, but why not give it a go? Now, I work in a job that I have ever since I finished studying design, nearly 13 years now, so don’t think that this move was to get away from a job I hate, it was more so an opportunity to maybe pry some doors open that I though would not normally be presented to me. So I jumped online, found the application form, filled in details, a bit about myself, my picture, my “food dream” and a million disclosure points, then save and submit. Time to wait and see. So yeah, obviously, got the invitation to audition, which in itself was nerve wrecking. I had to come with a cold dish, so decided a Thai Cold Beef Salad would be a good idea. Cooked, plated, presented, covered up, in an esky, ready to drive into the Rendezvous Allegra. Once I had gone past the registration, form fill in version 2.0 and played the waiting game, I soon realised mistake number one; dressing a salad an hour before presentation means you end up with a dish akin to wet compost… way to go Daniel. Pays to read, and re-read the instruction form. So, six of us sat in a room, opposite each other to introduce ourselves to our fellow hopefuls, explain our dishes and our food aspirations. In my group were three eventual Top 50 placers (for those keen Master Chef Fans), one of which was John Hughes (inspiring wine maker who has Cerebral Palsy, and one of the nicest blokes you’d ever meet) and from our group of six, three were decided to go through to interviews with the producers, and the director. Yikes. From there, I got told to come back the next day, and do a live cook in a commercial kitchen. Yup. Next day, I rocked up at Noarlunga Tafe, still telling myself “this will never happen, this will never happen” Esky in tow, with all of my ingredients, utensils, etc all inside. Then, as we were warned, the waiting game started. We waited, and waited. Three hours after our scheduled time, we got called into the kitchen, to our stations, and were told some instructions. First thing I noticed was the Master Chef logos, somewhat clumsily placed all over the walls. Secondly, the noise of the extraction fans. As it was a 40 degree day in Adelaide, the fans were the only things keeping us cool. We were told about the cameras, and that George would be walking around during our hour of cooking. We were told to act natural, which is easier said than done, when you have camera crews running around you in a confined kitchen. 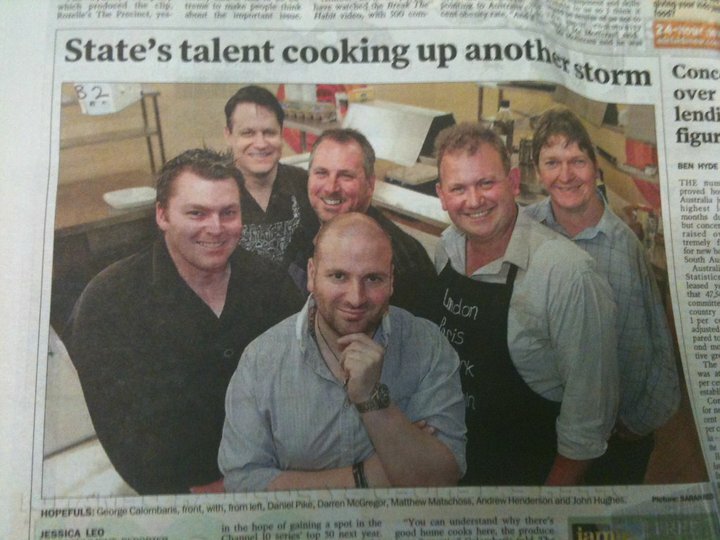 Just as we were about to start, we were told that the Advertiser wanted to run a story, and wanted to take a photo of us. There goes the whole “you need to keep it secret that you’re here” thing, that we were told. So we crowded around, and the below story hit the paper the next day. Not so much of a secret anymore now. That’s me on the left (about 23kg ago), you might recognise a few other faces! The next 60 minutes were surreal. Exactly like the show. “Your sixty minutes starts, (pregnant pause) NOW! And we were off in a flurry. I’m sure for the first three or so minutes I just looked around at my bench and tried to figure out “where the hell do I start?” I cooked the Rib Eye dish which features here on my blog, and made it to Gram magazine, which is something I have cooked plenty of times, so I was confident I would get it right. However in a commercial kitchen, as opposed to my home kitchen circumstances were poles apart. The thing with extraction fans, they make for horrible background noise during filming, so every time the team wanted to film you talking to George, the fans went off, and the temperature shot up instantly. Sauna like hot. Incredibly so. Everyone was filmed, so George could probe us about our interest, and what brought us here. I found him to be a very relaxed character, a bloke who wasn’t pretentious at all, and not the least bit intimidating. Except for the fact that due to filming, he had to stand right next to you, as in nearly on your feet, next to you. Any closer and I would be asking for flowers and a bottle of wine. Then as per the show, the count down, ten, nine, eight. You know how it goes. I had finished plating up five minutes or so before hand, so I was pretty calm. Other folks in comparison were cart wheeling around the kitchen in a panic (figuratively speaking of course) putting the finishing touches on their dishes. Then, as per the show, we were called up, one by one to speak about our dish, let George try it, and hear his feedback. I was second cab off the rank. Once again, George had to shuffle right up next to me, during filming. He looked at my dish, made a few remarks about why just a steak, running a risk on a plain dish etc, which I responded with a few lines about cooking what I liked, trying to mask my nerves. Then he hit me with some questions, which straight away told me he had been briefed up on me. He asked me about my wife and kids, about how they would cope with not having their Dad and husband home for eight months, and what really got me, is he referred to them all, by name. I can’t remember what I replied with, but my expression must have changed, which caused him to change too. All of a sudden what I thought was their script was out the window, it got personal. Just as quickly, the conversation retuned to the plate in front of me, with George asking how I cooked the big piece of now, lukewarm, two inch thick steak in front of me. With that he cut the steak right through the middle, quickly looked at how the centre looked, then held the cut back together (a bit of theatre for the camera) with a smirk on his face back at me. “Yeah, that’s what we’re hear for” once again, clumsily muttered. He showed me, and it was an even rose pink the whole way through, perfect. I started breathing again, and even got a few “oohs” from the film crew and producers standing near by. Then came another moment which I’d never forget, where George said a line which drew shocked looks from those behind the cameras. Then he spoke those words which titled this post. From then it was a blur. I made my way out of the kitchen to get a drink, to which I was bundled up by another producer who said “I don’t know if you understand what he just said, he doesn’t say that to just anyone, no one has had any comment like that so far.” Once again, wow. It was some time after all this happened, quite a few weeks in fact, that I had to make the decision to withdraw from the competition. I won’t mention the reason why, they’re too personal to share, but essentially, family will always come first, always. I’d never let my personal ambitions affect my family. Ever. Did I feel like I let the people down who gave me that chance? Yup. Did I feel like I let one of the biggest chances anyone would get slip through my hands? Yep. Do I regret doing what I did? Not at all. To be truthful, I would have never thought in a million years I would get as far as I did. That threw me. Making the call to withdraw was incredibly hard, because who knew what could have been? This was the opportunity that thousands around the country applied for, which I got, then gave back. Watching the first episode of Season Three (the giant mystery box flown in by helicopter) wasn’t as hard to as I first thought, it was incredibly exciting. Seeing those who I knew got in, finding out who got my spot (Andrew if you’re interested) and seeing what was going to happen. There were times throughout the series where I’d think, “what if?” or “What would have I done there?” but at no stage did I ever regret my call. From a purely selfish point of view the whole experience was incredibly humbling, and somewhat confirming of what my friends and family had been telling me prior to me even applying. I look back know and I know that somehow I’ll be more involved in food, I just need to find another avenue to get there. Since then, through this blog, and other social media platforms, many doors have opened, and I have met some incredible people. Heston Blumenthal, Simon Bryant, Callum Hann, George Calombaris, Billy Law and many more. I’ve made friends who share the same interests, met some incredible contacts and learnt so much, which I know will always continue. I’ll keep doing what I’m doing, talking to people, reading, listening, visiting and above all practicing and experimenting with food, and sharing it too. That’s what the whole game, the whole industry is about now isn’t it? So that’s it. The whole story that people have been asking about. Not that thrilling is it? Still it’ll always be a story that I’ll have, one of those where you’re sitting around a table, with a belly full of food and a few ciders under your belt and you start waxing lyrical about past experiences. Tell me what you think… let me know what you want to see! I’ve had quite a few comments from some of you all, and a theme seems to be developing, you would like to request some ideas for recipes, or ingredients to research. So I will be adding this functionality to the site very soon, so you can send me a request if you wish! So keep an eye out for that soon. Finally, the recipes and ingredients section will be updated very soon too. First ingredient review to come, something from the lettuce family…. Celery? Spinach? Chard? Nup, probably something that you would never has guessed. Thanks to my old man, and their very generous neighbours, I’m going to give this interesting looking veggie a bit of a go, so it will be the first ingredient that I will share knowledge on, try some different ways of preparing it (believe it or not it works well in salads) and what I think what type of dish it would work best in. So keep an eye out for that. Also, long weekend is upon us, so keep an eye out for a massive update to the blog over the next three days. Once i get the content up to a point where it it worth launching properly, I’ll do so. So, I’ve finally jumped onto the world of Twitter, and linked it on here! So, if any of you out there wish to follow me, search for pikeonaplate in Twitter, and you’ll hear updates to the site, news, and my general ramblings! Also, look for some big additions this week to the blog. I have around 30 recipes to come, each one a creation of mine, so keep an eye out on the “My Recipe” section for some new additions. I’m also intending on my weekly wanders to the Adelaide Central Markets to pick a new ingredient, and share what it’s main features are (from a flavour profile obviously!) but also what recipes it lends itself too. Coming up first, will be Dragon Fruit and Custard Apple, so keep an eye about that! Finally, I am also looking to extend the blog to include interviews with people from the food industry. From suppliers, growers and farmers, through to chefs, wine experts, critics and if I’m lucky the odd celebrity chef will share their thoughts, experiences and opinions here. So, plenty to come, I’ll keep you all up to date when it all starts! After twelve months of knocking about with ideas for food, what I like to cook, what I’ve tried to cook and, ultimately what I think of my food, I’ve got enough bits and pieces to finally get my blog up and running. And in the spirit of being giving, benevolent, sharing blah blah blah, I’ll be putting all of those ideas and food findings here. It will take some time to get them all up online, but be rest assured, they will all end up right here for you to cook yourself. Then you can don a cravat, tilt your head to the side when you chew, and give me a review, and let me know what you think! This site is going to grow quickly, with not only recipes of my own creation, but hints, tips, thoughts on food trends, plating and presentation and new techniques. When I learn, I’ll share it here, if I try something new, I’ll share it here, if I stuff up monumentally, well, you guessed it, it’ll be here too. I’ll also be sharing interviews with chefs and people in the food industry to try and get an understanding of how people’s experience and interaction with food and cooking has shaped their lives, and influenced those close to them. So keep an eye out for that! So, cheers for reading, and watch this space! What did I say when? ?